The modern day style violin was first made near the start of the European Renaissance in the 1500s. Prior to that there had been other stringed instruments that used a bow to vibrate the strings such as the lyra and the rebec from the middle ages. It is thought that the first violin to have four strings and closely resemble the modern violin was built by Italian Andrea Amati in 1555. The violin became very popular and the King of France at the time, Charles IX, had Amati build him 24 violins. The oldest surviving violin is one of these 24 violins and is called the Charles IX. Andrea Amati built his violins in Cremona, Italy where he and his sons would also apprentice some of the world's finest violin makers. As a result, Cremona is the home of the violin and the place where the world's greatest violins were crafted. Over the next 100 years the violin would become a very popular instrument throughout all of Europe. The construction and art of building violins would reach its peek in the 1600's with the two most famous violin makers, the Guarneri and the Stradivari family of violin makers (also called luthiers). They were both located in Cremona, Italy and both learned from the Amati school of violin craftsmanship. These musical instruments are still considered the best ever made. They are very much in demand by the top violinists in the world and a Stradivari violin, nicknamed The Hammer, sold for $3.5 million in 2006. Over the years the violin has gone through changes of design to end up with the current construction and dimensions. 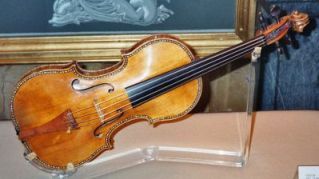 The first violins had a shorter and thicker neck. The bridge was flatter and the finger board shorter as well. Many of the changes were made to allow for a higher pitch as well as to produce more volume for orchestras. 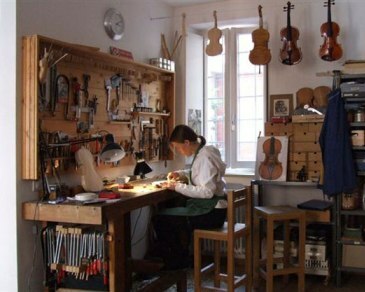 Antonio Stradivari started out as an apprentice to Andrea Amati's grandson, Nicolo Amati. In the 20th century the first electric violin was invented. Even though people try to recreate exactly what Stradivari did to craft a violin, no one has been able to match the older violins in tone and quality. This may be due to the materials and varnishes available. Most violinists consider a machine made violin to be nowhere near the quality of a hand crafted one built by a true luthier.